WARNING! Explicit Content! Trending Tonight talk to Aussie who punched the Kangaroo in the face! The video has been viewed over 3 million times and counting. If you haven't seen it already then watch below. 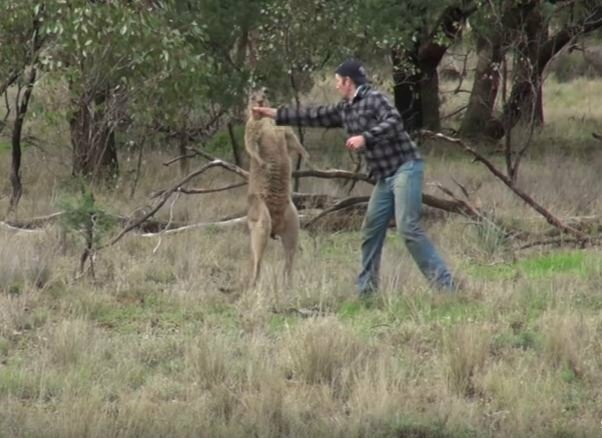 Our colleague Damon Beard broke the story on his show on Monday of an Australian man who walked up to a Kangaroo and punched it in the face. The kangaroo looked completely shocked at the sheer brashness of the man and skulked away. The roo was attacking a dog at the time when the man walked up to it. Although upon closer inspection and in my opinion it looked like the roo was trying to mate with the dog! I made a few phone calls and managed to track down the man claiming to be the Aussie in the video and booked an exclusive interview. Take a listen to what the guy has to say. Here is the video that Damon posted earlier.